Gardenia belongs to the family of the madder. The birthplace of this flower is South Africa, China and India. It is a very beautiful bushy plant with incredibly fragrant flowers. Leaves of gardenia of glossy, dark greenSaturated color, up to 10 cm. The new shoots have a light-salad color. Flowers are either solitary or collected in several pieces of 3-5 cm in size. They are white or milky with a pleasant and delicate aroma. 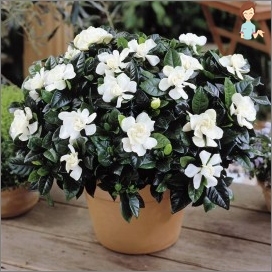 Flowering gardenia occurs mainly in spring and autumn. With abundant flowering, this incredibly beautiful plant will not only adorn the house, but will also endow it with a delightful fragrance. It is quite a capricious plant, susceptible to any changes, and reacts to conditions that are unfit for it instantly: yellowing and dumping of leaves and buds. 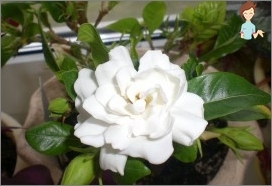 In order to carry out the cultivation of gardenia jasmine in the home, you need to put a lot of strength and patience. But when you see how buds bloom, and what they radiate aroma, you will not regret your time spent. This plant is very fond of moist air, so you need to spray the plant several times a day. When irrigation is to avoid getting water on buds and flowers, it is fraught with their death. Watering should be carried out as it dries upEarth coma. In spring and summer there should be more abundant watering. In spite of this, it is not worth pouring the plant, the soil should be moist, but not wet. Otherwise, the roots can simply rot. Just as terrible is the drying of the coma, it threatensThe death of the root system and gardenia in general. So there should be a measure in watering. Water for irrigation should be warm, slightly above room temperature, but not lower. Water should be filtered, soft and free of chlorine and other harmful substances. The plant does not like sudden temperature fluctuations. 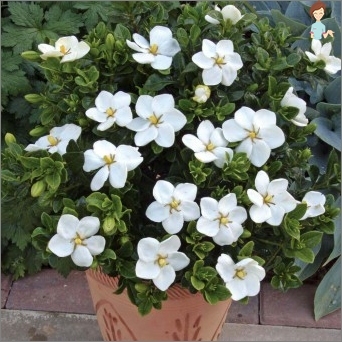 The optimum temperature of its stay is 22 ° C, not lower than 16 ° C.
Gardenia is a very light-loving plant. For full bloom and growth, it needs good lighting. But it is necessary to avoid direct sun rays, otherwise there may be a burn of leaves. In winter, you need to try to find in the house the most lit place for this flower. Very good southern windows, where in winter time the maximum of the sun. Top dressing should be carried out during the period of active growth, from March to August, every 2 weeks. And in the flowering period. 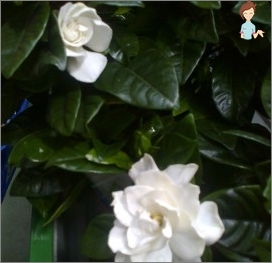 For gardenia jasmine, liquid fertilizers for flowering plants are suitable. Especially fertilizers with potassium content. 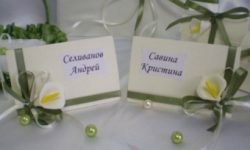 In March and June, preparations containing iron are introduced. This reduces the pH level in the soil, which is very important for gardenia. The gardenia transplant is carried out every 2 years, in the spring. Soil for gardenias should be acidic, with a pH of 4.5-55. You can check the acidity of the soil. In an empty pot you need to pour a little bit of ground, water. When the water flows, we dip a litmus paper into it. Gardenia does not tolerate a mixture with lime content. Suitable ground for azaleas. At the bottom of the pot you need to put drainage, this will reduce the stagnation of excess water in the soil. When transplanting, you need to cut off all the extra twigs and form a bush. Cut fresh cuttings. They are rooted in soil warmed to 25-27 ° C, periodically sprayed. It is good to use phytohormones. Rooting takes quite a long time. Before the rooting can be soaked, the shank ends in a powder stimulant. 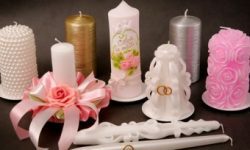 So good is the reproduction of gardenia seeds. 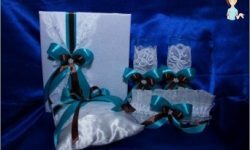 It is necessary to soak seeds of gardenia for a day, then to sow in a substrate from the earth and sand and cover with a film, regulating the moisture of the soil. Once the seedlings are out, the film can be removed. Among the pests of gardenia, aphids are often found,Spider mite, scab. When the pest is first detected, the plant should be treated with insecticides. Now in the shops there is a huge variety of them. More common: Fitoverm, Decis, Actellik, Inta-Vee.